Blue Spirit Liveaboard is a member of Blue o Two Fleet. This boat was rebuilt in 2002, now it’s a comfortable yacht that can offer an extended range of routes on Maldives Atolls. 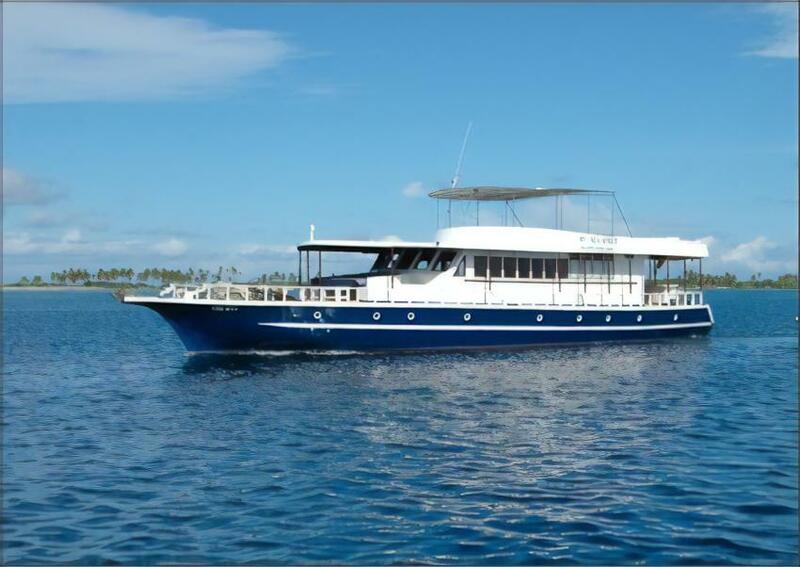 MV Blue Spirit can offer comfortable accommodation for 12 guests. And you can choose where you want to stay, book one of the double-berth rooms or share a twin cabin with another diver. Still, you will get all you need to feel comfortable during your diving adventure. Each room has air conditioning, private facilities and it’s quite convenient. Time in between dives and evening hours passengers of MV Blue Spirit can comfortably spend in boat's salon. Watch a movie on DVD or use boat library or just discuss your new diving adventures with other guests of Sea Spirit Liveaboard. But the best you can do besides diving is to enjoy a marvelous view of Maldivians blue ocean water on the sun deck. MV Blue Spirit has facilities to fill tanks with Nitrox for diving with certain certification. Also, a boat is rebreather friendly. It is supplied with three Bauer compressors. Maldives atolls are perfect for underwater photographers. It is amazing, rich, colorful and vivid. A variety of different species can make your photos really outstanding. Plus MV Blue Spirit has facilities to charge your cameras before next dive and also a storage place for a photo equipment. MV Blue Spirit can offer to a diver not only comfort on board but underwater. Because of a small capacity and possibility to divide divers into two groups, each of two dive guides can offer a personal support while you are diving. Dive crew will care for your every need. MV Blue Spirit's safety is ensured by an experience of the crew team. The boat has the necessary facilities, like first aid kits, life jackets, and emergency oxygen equipment. MV Blue Spirit itineraries will be interesting even for a very demanding diver. Try diving with magnificent mantas. This pelagic species can be often met at Baa Atoll. They are literally flying around coral reefs. Another popular route of Sea Spirit Liveaboard is central Atolls and beyond. during this 12 days trip your wonderful chance to dive near North Ari and Lhaviyani Atoll. Fish Head - one o the dive sites in this diving destination. It is known for a high possibility to meet grey reef sharks and white tip reef sharks. If you have enough experience, you can discover Lhaviyani, that becomes a home for several sunken ships. Divers can discover this wrecks encrusted with corals while they are diving with MV Sea Spirit. High season for diving on the Maldives begins in December and end in May. But diving here is available all year round because of good visibility and water temperature, that is usually around 26 to 29C. From the trip starting to finish dave and Lisa were so attentive to everyone's requirements, cannot hold them in any more higher regards...thank you.